This recipe might just help you to do that. Mix the dry together in large bowl and then all the wet together to add to the dry. If you don’t have flavored creamer just change milk to half cup and add 1 tsp vanilla. You can also use whatever type flours you desire. I use whole wheat for most of my recipes. Incorporate all ingredients by hand except blueberries but do not over mix. Before folding in the blueberries, I mix them with a couple of Tbs. of sugar first but this is optional. Fill all cups at least 3/4 full. Should make more than 12 regular size muffins. Bake at 350° for approximately 30 minutes. Sometimes mildly bi-polar is not so bad. I’ve never been officially diagnosed as such but it runs in my family and my Doctor recently told me that it’s possible I may be “mildly” bi-polar because I’m a creative type and very sensitive. I’ve always been able to function normally, sort of, so this comment did not surprise me in any way. Not sure why all the labels they insist on giving everyone, but on to the challenge and that is I made blueberry muffins early this morning. Someone gave me a whole slew of frozen blueberries last week and I’m not going to let the go to waste! Besides, I have to make way in the freezer for ice cream cause summer’s comin’ fast! Thank God! Sometimes it appears I become obsessive when taking photographs of various subjects, which is why digital is truly a blessing. I used up rolls of 35mm film years ago and it was quite expensive. I was playing with my macro lenses and want to share some of the over 100 shots I took this morning. I couldn’t stop! Blueberries produce such fascinating hues and muffins are so textured! 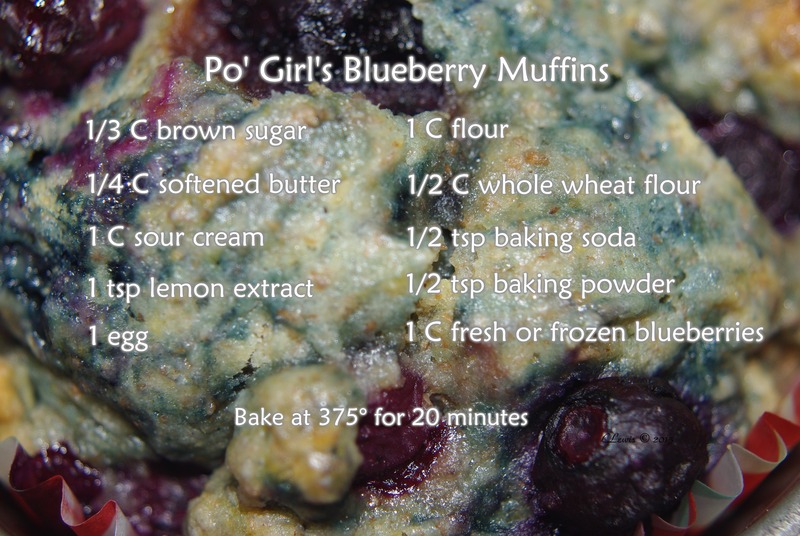 Enjoy my blueberry muffin art and try not to get hungry. There is a recipe at the bottom in case you want to try these. Omelet with salsa on corn tortilla for breakfast. Click the above picture for more info on Cinco de Mayo! Enjoy pictures from my visit to Mexico. I used to think that breakfast meant cereal, yogurt or eggs and whole wheat toast. Even bagels and cream cheese from Panera or an Egg McMuffin. I have decided to shed about 10 pounds in the next month or two and I am now trying to streamline my eating for this loss. Then I figure I can add fairly normal carbs to each meal, even a small dessert, and maintain as long as I stay physically active. The most important part of breakfast to me now is protein. A little fiber and even less sugar is OK too. I know my muscles need the protein and as long as I have sufficient carbs higher in fiber, it will be good for me even while losing the weight. I sometimes make up 6 of these little breakfast h’orderves. I do know that if I keep my portion small with enough protein, I do not feel hungry soon after like I was doing eating larger meals. It is a deadly cycle. Eat alot, crave alot! I hate it! These are some breakfasts that taste good, and are high in protein but equally high in fat so not so good for you. Just make sure to eat smaller amounts. For more hints & tips check out the recipe page at pogirlshines.com. Thinking about filing a lawsuit against Kellogg’s of Battle Creek. Check out what happened to me this morning! Why do you think they call me Po’ Girl?